Q: Are there any restrictions on reselling my property? A: There are no restrictions on reselling your property. You can sell your property privately or use property brokers including Laguna Property Resale. Q: What are other expenses/taxes involved and how much would that be? *The fees you see above are simply an estimate and not all fees apply. Consult your accountant or financial adviser for a detailed analysis based on your particular tax situation. Q: What kind of ownership transferred to the new buyer? A: For residential properties such as Laguna Park, Laguna Tonwhomes, Residences, Banyan Tree Grand Residences), ownership may be freehold to Thai citizens and leasehold to foreign buyers. For hotel managed properties located within hotels such as Dusit Thani Pool Villas, Banyan Tree Pool and Double Pool Villas, all properties are sold on a lease-hold basis. 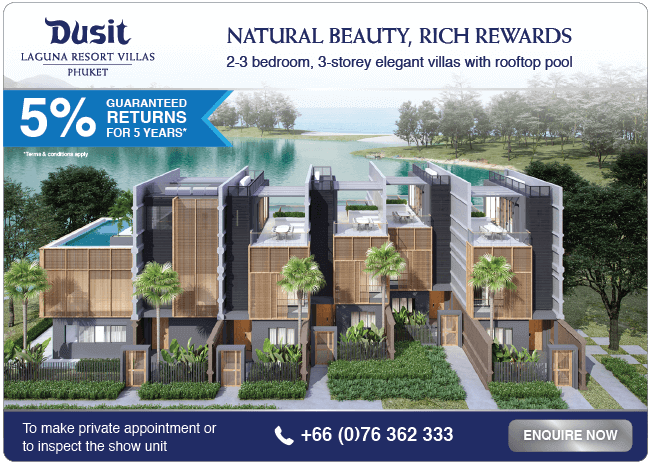 For condominium properties such as resale Allamanda Condominiums, Angsana Island Villas, Laguna Village Villas, and Cassia Residences, according to Thai Law, foreigner buyers can own freehold up to 49% of a condominium development salable area. If any freehold allocation becomes available, leasehold buyers can upgrade their property ownership to freehold. Q: If my property is leasehold, what is the lease term for the new buyer? A: Your new buyer will have the remaining lease period of your property. Please contact Laguna legal department for more information. A: Our agreements have been used for a number of years and have been reviewed by major international law firms. However, should you wish to obtain specific advice regarding the structuring of your investment, we recommend you consult with a professional legal and/or financial adviser.